ST. JOHN'S, NEWFOUNDLAND--(Marketwired - Dec. 4, 2013) - Canada Fluorspar Inc. (TSX VENTURE:CFI) (OTC:CNDFF) ("CFI" or the "Company"), is pleased to announce new mineral resources of the Director Vein and AGS Vein (formerly the Grebes Nest Vein) deposits at its 100% owned St. Lawrence property in St. Lawrence, NL, including 2.1 million tonnes of Indicated Mineral Resources at an average grade of 51.0% CaF(2)and 8.5 million tonnes of Inferred Mineral Resources at an average grade of 42.2% CaF(2), as disclosed in the Company's National Instrument 43-101 compliant Technical Report titled "Technical Report on the Director Vein Extensions and AGS Vein Deposits, St. Lawrence Property, Newfoundland and Labrador" prepared by Agnerian Consulting Ltd. (Agnerian) and dated November 15, 2013 (the "2013 Technical Report"). The 2013 Technical Report was filed under the Company's profile on SEDAR (www.sedar.com) on December 4, 2013. The key assumptions, parameters and methods used to estimate the mineral resources, as well as other relevant information, including data verification, with respect to the Director and AGS Veins can be found in the 2013 Technical Report. These resources are based on recent drilling at the down-dip and southern extensions of the Director Vein as well as the western part of the AGS Vein (Figure 1). These resources are estimated by MFW Geoscience Inc., in cooperation with Agnerian Consulting Ltd., by constructing a block model of the mineralized zones of these two vein systems. The table below lists the tonnage and average grades for each of the Director and AGS Veins. (1) CIM definitions were followed for the resource estimate. (2) Mineral resources are estimated at a cut-off grade of 20% CaF(2)and a minimum horizontal width of 2.0 m.
(3) Average density of mineralized rock is 3.10 t/m(3). (4) Tonnage and average grade numbers are rounded. (5) Mineral resources exclude mined out areas from historical mining. The thickness of the Director Vein ranges from less than 1.0 m to more than 11.0 m, and the thickness of the AGS Vein ranges from 2.0 m to approximately 20.0 m, with values of mineralized intervals of diamond drill core samples ranging from 7% CaF(2)to approximately 90% CaF(2). There are additional areas of fluorspar mineralization adjacent to the old mined out parts of the Director Vein above the 550 level of the historic fluorspar mine. Mineralization in these areas ranges from approximately 1.0 million tonnes to 1.2 million tonnes at average grades ranging from 50% CaF(2)to 55% CaF(2). Agnerian Consulting Ltd. is of the opinion that this material cannot be considered as Mineral Resources at the present time, because of weak ground conditions experienced during mining in the past between levels 550 and 250. To view the map associated with this release, click the following link: http://media3.marketwire.com/docs/fluor.jpg. Mineral Resources: At a cut-off grade of 20% CaF(2)and a minimum horizontal thickness of 2 m, the Mineral Resources of Blue Beach North and Tarefare veins total approximately 9.1 million tonnes of Indicated Mineral Resources at an average grade of 42.0% CaF(2), and 950,000 tonnes of Inferred Mineral Resources at an average grade of 31.1% CaF(2). 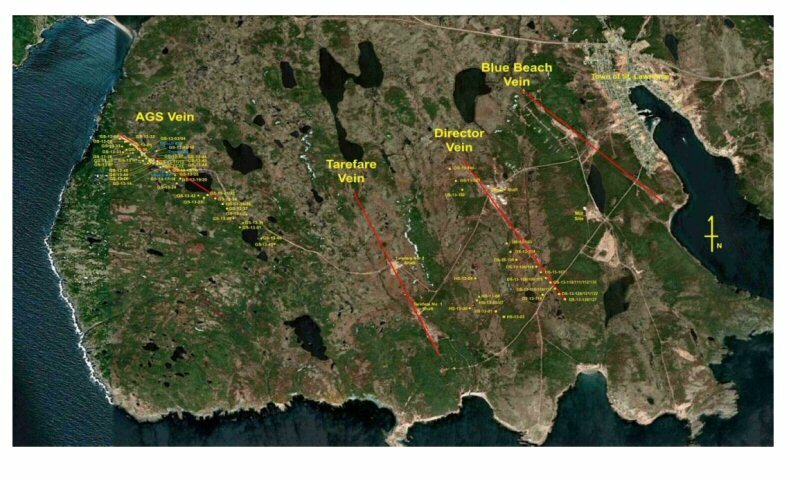 Mineral Reserves: At a cut-off grade of 30% CaF(2)and a minimum horizontal thickness of 2 m, the Probable Mineral Reserves of the Blue Beach North and Tarefare veins total approximately 5.4 million tonnes at an average grade of approximately 39.8% CaF(2). The Mineral Reserves are part of the Mineral Resources. The key assumptions, parameters and methods used to estimate the Mineral Resources and Mineral Reserves, as well as other relevant information, including data verification, with respect to the Blue Beach North and Tarefare Veins can be found in the 2009 RPA Report. The Blue Beach North and Tarefare Veins have overall average widths of 5.0 m and 3.5 m, respectively. Lindsay Gorrill, President and Chief Executive Officer of CFI, said, "We are very pleased about the discovery at the AGS Vein, and estimates of the Mineral Resources at the Director Vein and AGS Vein. This opens up a new avenue for development of fluorspar mines at St. Lawrence. Our immediate plans include further in-fill drilling at the western part of the AGS Vein and drill testing at the eastern half of the AGS Vein system, in an effort to upgrade the Mineral Resources in the western part, and increase the Mineral Resources of the AGS deposit". The technical information contained in this news release is based upon information prepared by Hrayr Agnerian, P. Geo. and President of Agnerian Consulting Ltd., and Michael F. Waldegger, P. Geo, of MFW Geoscience Inc., each of whom is a "Qualified Person" as defined in National Instrument 43-101 -Standards of Disclosure for Mineral Properties. The Company is a specialty mineral resource company engaged in the development of fluorspar deposits located in St. Lawrence, Newfoundland, Canada, and is proposing, through Newspar, its 50/50 joint venture with Arkema, to reactivate the existing Blue Beach North and Tarefare underground fluorspar mines, by expanding the existing mill and constructing a new, environmentally sound Tailings Management Facility. For more information please see: www.canadafluorspar.com. This press release contains forward-looking statements which include, but are not limited to: resource estimates, proposed mining techniques required to construct and produce at expected levels, anticipated timing for completion of metallurgical testing, the commencement of the drilling program, current development and operating objectives and outlook, expectations, opinions, forecasts, projections, guidance or other statements that are not statements of fact. Although the Company believes that the expectations reflected in such forward-looking statements are reasonable, it cannot give any assurance that such expectations will prove to be correct. Results of the Company may be affected by a variety of variables and risks associated with mining development including: loss of market, volatility of commodity prices, currency fluctuations, imprecision of reserve estimates, environmental risks, competition from other producers, ability to access sufficient debt and equity capital from internal and external sources, ability to generate sufficient cash flow to meet its current and future obligations, regulatory approvals affecting construction and mining operations. Such forward-looking statements are also based on a number of assumptions which may prove to be incorrect, including, but not limited to, assumptions about the following: the availability of financing for exploration and development activities, the estimated timeline for the development of the project at St. Lawrence, the supply and demand for, and the level and volatility of the price of fluorspar, the assumptions on which resource estimates are based, the receipt of necessary permit, market competition, ongoing relations with employees and impacted communities, and general business and economic conditions. Should one or more of the risks or uncertainties involved in forward- looking statements materialize, or should the assumptions prove incorrect, actual results may vary materially from those anticipated, believed, estimated or expected. Accordingly, readers should not place undue reliance on forward-looking statements. Forward-looking statements are qualified entirely by this cautionary statement and are given only as at the date of this press release. The Company disclaims any obligation to update or revise any forward looking statements, whether as a result of new information, future events or otherwise, except as required by law. About this company Canada Fluorspar Inc.